Dr. Matthew Milestone and the professionals at Milestone Orthodontics are used to advising their patients about food restrictions during orthodontic treatment near Rutherford, NJ. Their patients undergoing treatment with Invisalign have less restrictive dietary guidelines than do those patients being treated with traditional braces. So what foods can you eat with Invisalign? Foods that could damage traditional braces during eating are not an issue for Invisalign wearers because the trays are removable for meals. They are put aside while eating and are not affected by the food being consumed. When a patient progresses to a new set of Invisalign aligner trays, eating softer foods like pasta, eggs, or yogurt can ease any discomfort associated with chewing that might occur during the adjustment period to the new trays. Dr. Matthew Milestone and the team advise patients to be sure to brush and floss after each meal and before refitting the aligner trays. Sticky or sugary foods can cling to the surfaces of the teeth and promote tooth decay. Refitting the Invisalign trays after eating and not cleaning the teeth immediately before can trap this food debris and create an environment for cavities and tooth decay. Invisalign wearers are encouraged to remove the trays before consuming something that might stain them. Smoking and drinking wine while wearing Invisalign clear aligners are not recommended and may permanently stain the trays. 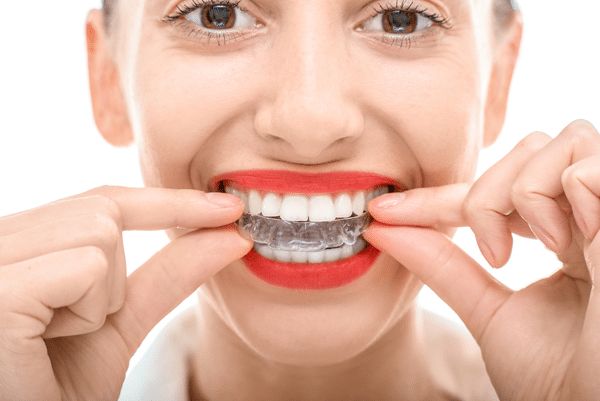 Invisalign is made of a clear thermoplastic and is sensitive to heat. Hot liquids may distort the shape of the Invisalign aligner and affect its ability to perform as prescribed.